"When a small child, I thought that success spelled happiness. I was wrong, happiness is like a butterfly which appears and delights us for one brief moment, but soon flits away." Most of you remember the Laguna Beach Butterfly and Habitat Update blog I published showcasing the butterfly garden I installed when employed as a Parks Gardener up at Alta Laguna Park in Laguna Beach, Calif.
Well, the Alta Laguna Park Butterfly Garden project is abandoned, derelict, kaput; orphaned by my untimely exit via early retirement after sustaining a rather severe shoulder injury at work. Soooooo... what's this new blog all about? Still am enthralled by these beautiful creatures. In the words of Rocky Balboa from the 70's movie Rocky: "They remind me of flying candy." (remarking on the cage full of colorful parakeets his new girlfriend had in her apartment). After a bit of thought over the fact that living in an average mobile home park affords the least amount of real estate that can be transformed into a butterfly garden (or any type of garden for that matter), I wanted to at least put a few butterfly-specific plants out for them. The landscape was designed with minimal maintenance in mind featuring cacti, succulents, rock and gravel with an occasional piece of decorative driftwood tossed here and there as a garnish. Looking around the place, the realization came that there was a barren strip of property directly below the front porch and towards the back of the lot that was all gravel and nothing else and was pleading for some attention and a facelift. Containers!!! I'll get a bunch of pots and bowls and planters and such and mass them together to create a dedicated butterfly garden. For the next few months I'll be purchasing and placing pots along the side of the house, while at the same time planting seed in seed trays for germinating. This way a whole lot of plants can be acquired on the cheap; not only that, but when perusing local seed racks and online seed sources, one can find an exhaustive array of offerings that just can't be found through local venues in the form of assorted-size containers, plus six paks, pony paks, color paks - whatever flower and veggie packs are called on your side of the tracks. I also published a new butterfly web site called Attracting Butterflies in So Cal, thanks to Gayn Winters of Laguna Beach who through email correspondence regarding the plight of the Alta Laguna butterfly garden sparked a fire under my tail to create a new one. I took the old site that was primarily geared towards Alta Laguna Park, revamped, rewrote, and specifically tailored it for Southern California gardens . Much of the information though can be utilized in other parts of the country. 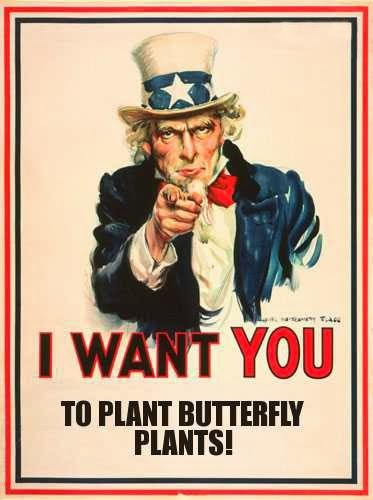 So, stay tuned as A Container Butterfly Garden chronicles the antics and shenanigans of a retired gardener and inveterate butterfly lover in his quest to create a little bit of Paradise here on earth.